(Photos by Darren Andrew Weimert) Volunteer emergency medical technicians Abby Stephens and Chief Jason Brooks, aboard a Penns Valley EMS ambulance, demonstrate a technique to help a patient breathe. Ryan Etzel, a volunteer EMT for Centre LifeLink EMS. Scott Rawson, executive director of Centre LifeLink EMS, says volunteers are vital to the organization. (Photo by Darren Andrew Weimert) Hank and Karen Sterling are volunteer grocery assistants at the State College Food Bank. Editor's note: In honor of National Volunteer Month, Town&Gown annually salutes residents who give back to our community. This year we profile a dedicated group of emergency medical technicians, and a couple who helps feed those in need through the State College Food Bank. Ryan Etzel has a habit of coming across accidents, so he decided to do something about it. So Etzel completed the training to become an emergency medical technician. 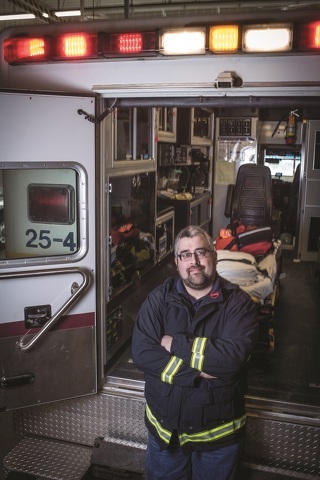 He started as an EMT in 2010, and remains an active volunteer with Centre LifeLink EMS. Simply wanting to make a difference in the community is a common refrain among volunteer EMTs. But it’s a taxing job in many ways that requires at least 200 hours of initial training, followed by hundreds of hours annually of service time and additional training for the most dedicated volunteers. The number of volunteers locally is dwindling, mirroring a national trend. Penns Valley Emergency Medical Service has a roster of 25 volunteers, but that number is “deceivingly high,” Chief Jason Brooks says. All but about six of those volunteers work only for special events such as the Centre County Grange Fair and the Nittany Antique Machinery Shows, says Brooks, himself a volunteer EMT. “Our service parallels the story of EMS in the United States,” he says. Penns Valley EMS was formed as an all-volunteer service in 1997 with the merging of the Centre Hall and Millheim-Rebersburg services. The first paid EMS responders started around 2004, Brooks says, covering day shifts when most volunteers were at work. Overnight staffing was established in 2010. Penns Valley now has seven full-time paid EMTs, with about 10 part-timers who fill in as needed. But that fact that people can find paying jobs as EMTs (although the pay is often low) presents challenges in recruiting volunteers vital to keeping many EMS organizations afloat financially. “Who’s going to volunteer to pay $500 to $1,000 and to give 200 hours of their time just to get the training certificate?” Brooks says. “And then say, ‘Sure I’ll be on call,’” for shifts that are often 12 hours long, continue their education, and deal with an increasing amount of paperwork. It takes a “truly a special group of people,” Brooks says. And that’s exactly what you’ll find at EMS stations throughout Centre County. 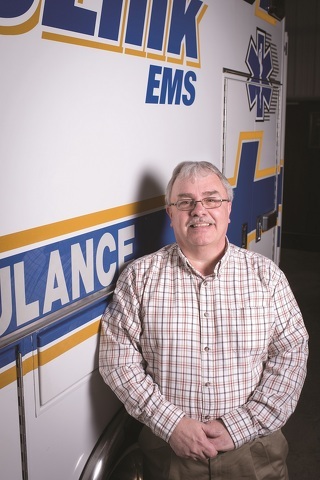 Keith Peese, who works as a phlebotomist at Mount Nittany Medical Center, has been a volunteer EMT since 1996, almost all of that time with Penns Valley EMS. That sentiment was echoed by three fellow volunteers who joined Brooks and Peese at the Penns Valley EMS station on a recent evening. Brittany Snyder, of Rebersburg, has volunteered with Penns Valley EMS for about a year, and has been with the fire company EMS for about five years. 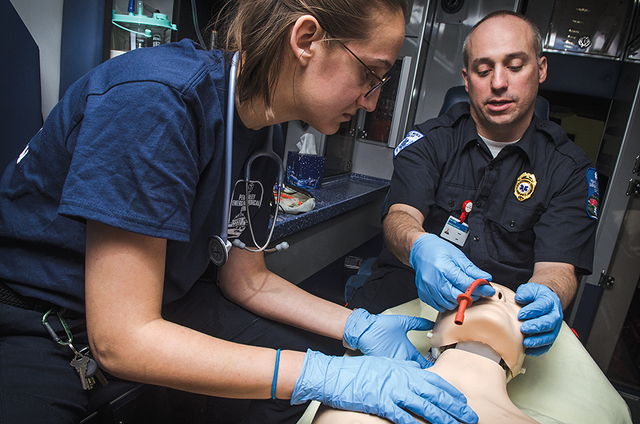 In early March, Abby Stephens was close to finishing her stint as an EMT trainee in Penns Valley before being cleared to be part of a regular two-person crew. Trainees run as a third member of a crew. Stephens graduated from Ohio University last year, lives in State College, and works as a phlebotomist at UPMC Altoona. She’s been volunteering as an EMT in Penns Valley since August. Both Penns Valley and especially Centre LifeLink benefit from Penn State student volunteers looking to get hands-on experience while studying for careers in the medical field. “They’ll volunteer with us for a couple of years, but we know we’re going to have that turnover” as the students graduate, says Centre LifeLink Executive Director Scott Rawson. Finding longer-term volunteers rooted in the community is a bigger challenge, particularly as requirements to gain and maintain certification increase. Beyond the training and time commitment, volunteers must “have the right constitution to be able to do that kind of work, to be around people at that time in their life,” Brooks says. But for those who take on the challenge, there is satisfaction in knowing they’ve made a difference. Etzel’s experience as an EMT led him to make a career change from the computer field (he’d been laid off from his job) to return to school to become a registered nurse. He recently started as a nurse at Mount Nittany Medical Center. Centre LifeLink, which primarily serves State College Borough and Ferguson, Harris, College, and Patton townships, has about 40 volunteers and another 40 or so full- or part-time paid EMS staffers. Like elsewhere, Centre LifeLink’s volunteer numbers are falling. EMTs put in about 15,000 volunteer hours in 2016, and 12,000 last year. “Our numbers dropped back some, but if you look at 12,000, that’s almost six full-time equivalents that we don’t have to pay for our staffing,” Rawson says. Penns Valley EMS has faced serious financial challenges recently, prompting a town hall meeting in October to discuss options for survival of the service. Brooks says things are “moving in the right direction,” as five of the seven municipalities in Penns Valley put in some funding for the current year, and all seven have verbally agreed to seriously consider budgeting funds going forward. But the need for fundraising and volunteers remains great. “If this community is going to have an organization like this survive, it’s going to take commitments from a lot more people,” Brooks says. For more information on Penns Valley EMS, visit pennsvalleyems.com or call (814) 422-8015. For more on Centre LifeLink EMS, visit centrelifelink.com or call (814) 237-8163. Ride-alongs can be arranged. In 2017, the State College Food Bank prevented 1,585 local people from going hungry in 694 households. None of it would have been possible without the food bank’s volunteers, who contributed more than 12,000 hours to help their community. Hank and Karen Sterling have been volunteer grocery assistants at the State College Food Bank for four and three years, respectively. The Sterlings started volunteering on a recommendation, as well as to meet new people. “Everybody here is so nice,” Karen Sterling says. As grocery assistants, the Sterlings help the food bank’s clients pick out the food they will take home. The generosity of the local community has allowed the food bank the resources to give clients choices. Last year, more than 469,466 pounds of food was donated; that’s enough for 391,221 meals. The State College Food Bank was able to distribute 421,874 pounds (351,561 meals) to their clients as well as share 62,265 pounds of food with other local food pantries and service agencies. “You see the good when you volunteer here,” Karen says. 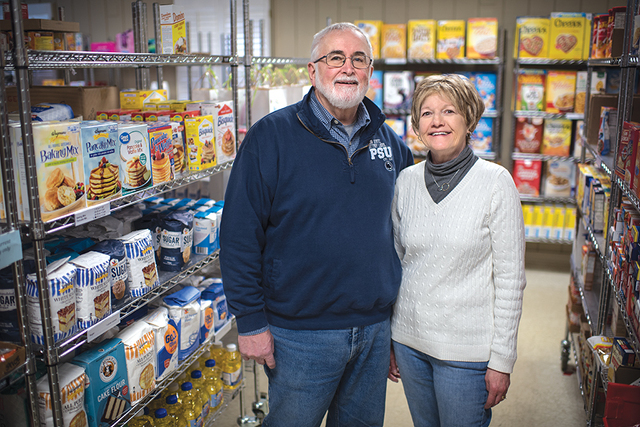 The Sterlings admit that like probably many others in the community, that they didn’t know that State College and the surrounding community had the need for a food bank. “I keep saying ‘thank heavens for the food bank’ because the need is there,” Karen says. Of the nearly 1,600 local clients, 32 percent are children and another 19 percent are 60-years-old or older. The Sterlings want anyone considering volunteering to know the joys they have experienced. For those who don’t have the time at the moment to volunteer, the food bank accepts donations of food and money. The State College Food Bank is located at 1321 South Atherton Street in State College. Drop off hours are Mondays, Wednesdays, and Fridays from 9 a.m. to 12:30 p.m. For more information, visit scfoodbank.org or call (814) 234-2310.